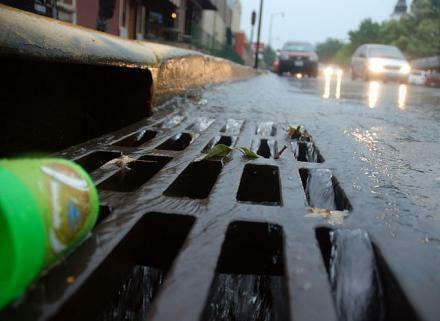 The Missouri Supreme Court heard arguments Tuesday for and against the constitutionality of a Metropolitan St. Louis Sewer District storm water fee. MSD imposed the charge in 2007 based on the impervious area on a customer’s property, which causes water runoff. MSD was sued by William Zweig of Chesterfield and two other customers, who claimed that the charge is really a tax and that would violate the Hancock Amendment to Missouri’s constitution because MSD didn’t get voter approval. Zweig’s attorney, Richard Hardcastle, argued Tuesday that the charge based on the impervious area of a property is not imposed for a service. "There's no question that this is a levy, a fee charged. If you own impervious area you get charged. If you take steps to minimize the runoff from your property, you pay full boat. You cannot turn off the service, you can’t turn it on. You can’t elect to buy more of it presuming that you knew what it was. You pay the same month in, month out, whether it rains or it shines," Hardcastle said. MSD attorney John Gianoulakis told the court Tuesday the fee is a legal way to pay for problems caused by storm water runoff. "This was just an objective and an appropriate and fair and equitable way of determining the costs and applying those costs on a proportionate basis based on the impervious area because that’s what causes the need for this system," Gianoulakis said. A circuit court judge agreed with the customers in 2010 and the Missouri Court of Appeals upheld the ruling last year. The state Supreme Court will issue a ruling in the case later.